MYSTERY RANCH (1934, Reliable) Tom Tyler, Roberta Gale, Jack Perrin, Louise Gabo, Charlie King. Tom’s a mystery writer invited to a dude ranch. Several grim events occur, but all were faked for Tom’s benefit. It seems the owner wants Tom to help his struggling ranch. However, when a real robbery occurs, Tom ignores it, thinking it’s a fake, too! An OK Tyler film with nice bits of humor. 16mm. 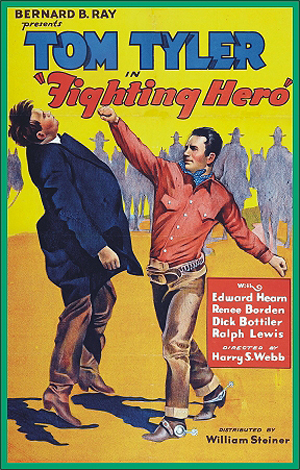 THE FIGHTING HERO (1934, Reliable) Tom Tyler, Renee Borden, Edward Hearn, Bick Botiller. A Mexican gal is tried for killing a well-known citizen, whom she really killed in self defense. Tom saves her by abducting her after she's convicted. They fall in love. Later, she falls in with crooks! 16mm. FAST BULLETS (1936, Reliable) Tom Tyler, Rex Lease, Al Bridge, Margaret Nearing. Tom and the Rangers battle Al Bridge and his cutthroat gang. Tom gets one of the gang (Lease) to go straight and help him infiltrate his old gang. However, things take a dangerous turn when one of the gang blows the whistle on Tom, putting his life in danger. From 16mm. THE LOST RANCH (1937, Victory) Tom Tyler, Jeanne Martel, Lafe McKee. Two eastern gals are bushwhacked by a gang of cut-throats. The outlaws take them to a forgotten ranch, hidden in the hills of an overgrown area. One of the girls' fathers is being held there, too. Tom comes to the rescue. 16mm.